Meetings with attendees residing in other locations and foreign countries, telephone conferences held from mobile offices, communication with investors and the press—all this is an integral part of the modern working life. In order to convey all information in spite of long distances or vast audiences using the right equipment is decisive. 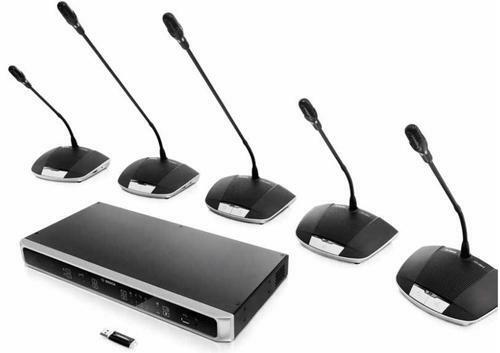 Whether for two-person meetings or big conferences with up to 400 discussion units: Sennheiser offers the ideal audio solution that makes sure every word will reach the audience or the interlocutor reliably and crystal clear. Our company is an iconic trader and supplier of the widest range of high quality Audio Visual Systems, which include Sound Reinforcement System, Executive Conference System, P.A Communication System, Safety Security System, Board Room System, Fire Alarm System, CCTV System, Access Control Systems and Professional Audio Visual Systems. In addition, we also provide professional Installation Services for the same. These Audio Visual Systems, which are simple to install, maintain and operate, are a great way to protect enclosed and outdoor places against different types of threats such as burglary, theft, shoplifting, pilferage and other crimes as well. We are further renowned resellers as well as system integrators for these Audio Visual Solutions. Our well equipped systems find their application in many specific set ups such as educational institutions, shopping malls, hospitals, business establishments, factories, residences, offices and other vast commercial spaces & complexes. Our Audio Visual Systems secure the places wherein they are installed and enable for effective monitoring and security.